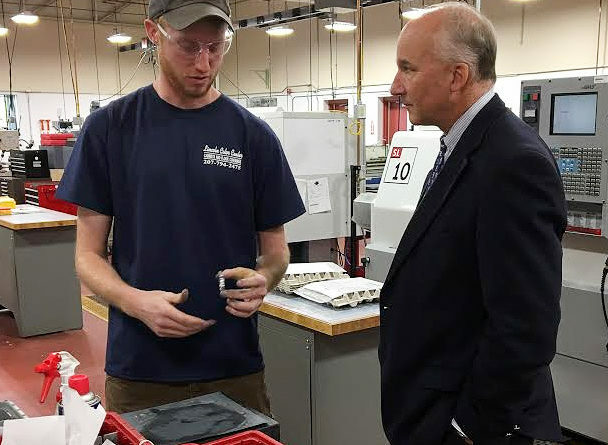 Brady Hawking, a precision machining technology student at Northern Maine Community College in Presque Isle, explains to Maine Community College President Derek Langhauser the project he is working on. The seven-school system, with more than 16,000 students enrolled this year at campuses around the state, has typically received strong support from Maine voters when asking for investment. This past November, the community college system secured $15 million in bond funds with nearly 65 percent of the vote. That support for the system is well-deserved. But given the immediacy of Maine’s workforce needs, our community colleges will need to play an even bigger role. According to the system, 94 percent of its incoming, degree-seeking students are from Maine. And for its 2016 graduates, more than 90 percent secured employment in Maine or continued their education — mostly staying in the state to do so. At a time when we need to be retaining young people and retraining adults for today’s economy, those results are particularly meaningful. By definition and mission, Maine’s community college are local workforce-building institutions. They aim to give graduates transferable skills and directly connect local employers to the next pool of talent. And it’s an impact that is felt immediately by students, businesses and communities across Maine. The system’s current president, Derek Langhauser, has doubled down on that emphasis in his four years at the helm, with a particular emphasis on helping adult learners gain new skills to adapt to a shifting landscape for workers. He is not hesitant to acknowledge the uphill slog Maine faces in this work. “The workforce crisis — it’s not something to get ready for. It is here,” Langhauser told the BDN. The outgoing system president first assumed the role on an interim basis in 2015 when longtime President John Fitzsimmons stepped down after a rocky relationship with then-Gov. Paul LePage. Fitzsimmons had tackled the difficult transition from technical colleges to community colleges, laying the groundwork for Langhauser to help re-energize the system after some political tumult. Not unlike encouraging developments we’ve seen within the much bigger University of Maine System, Langhauser has also worked to increase connectivity across the community college system campuses. Fostering collaboration, rather than competition, will help in the long run with statewide workforce efforts. The same can be said of increased credit transfer, communication partnership between the community college and university systems. A lawyer by trade, and the system’s former legal counsel before taking the top job, Langhauser won’t be in charge of the community college system much longer. He is headed to the executive branch to serve as Gov. Janet Mills’ chief legal counsel starting later this month. The change in leadership is not cause for alarm. The the community college system’s board of trustees did not go far to find a replacement in Dave Daigler, the system’s current vice president and chief financial officer. Langhauser and other officials from around the system credit Daigler with a large role in the community college system’s advancement over recent years, and unsurprisingly, they anticipate a smooth transition given how closely the two have worked together. While Langhauser brought a lawyer’s perspective to the job, Daigler brings a financial speciality and business background that could prove increasingly useful in engaging with employers, even if the new president isn’t looking to rewrite the script anytime soon.